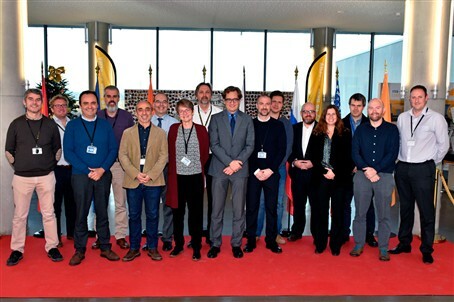 Members of staff of F4E, ITER Organization, experts and companies participating in the Preliminary Design Review of the ITER Divertor Cassette Remote Handling system procured by Europe. In the lifecycle of an ITER component design reviews are known as the moment of truth. Background knowledge, R&D results, systems designs and supporting analyses, forecasts and alternatives are presented to external experts, in-house engineers and teams managing component-interfaces in order to get their support to move to the next stage. Almost like defending a thesis in front of a panel of specialists who are there to listen and to critically question the speaker. During a two day meeting which took place at the headquarters of the ITER project (Cadarache), F4E’s Remote Handling team organised the Preliminary Design Review (PDR) of the ITER Divertor Remote Handling system. Experts gathered to learn, ask and assess the work carried out by F4E and its partners. ITER’s technical maintenance will partly be carried out remotely. Given the fact that engineers will not be able to enter the machine, they will have to use cameras and smart tooling to access the labyrinth of equipment with extreme precision. The ITER Divertor is located in the lower part of the device, consisting of 54 cassettes measuring 3.4 x 1.2 x 0.6 m, weighing 10 t each. It is where the temperature of the superhot plasma will be felt most. The divertor cassettes will form a massive "ashtray" where the hot ashes and impurities will be diverted to, and eventually, fall into. It is foreseen that these components will be replaced several times during ITER's lifecycle. It is estimated that 10 000 tasks and 4 000 unique functions are required to be carried out in order to replace the component over six months. Man in the loop robotics, powerful computers and water hydraulics will be some of the technologies deployed to perform the task. The proposed design is incorporating radiation hard multiplexing and cameras. The second session of the PDR is scheduled to take place towards the end of the month giving F4E the opportunity to elaborate further on the system and reply to questions raised during the first session. When this stage is concluded the chapter of the Final Design will begin. “I am pleased to see years of work, producing vast amounts of engineering and R&D, culminating in this event. We want to make good use of it through the Preliminary Design Review and, with the instructions and recommendations of the panel, move on to the phase of design. We want to learn from this exercise and draw lessons for the other Remote Handling packages that will go through their respective PDRs in 2019,” concludes Carlo Damiani, F4E’s Project Manager for Remote Handling.